ORONO, Maine-- Jakub Sirota's first collegiate goal led the Black Bears to a key 4-4 tie against New Hampshire on Monday. First Goal (Maine 1-0): Brendan Robbins opened the scoring with a rotation up high before Mitchell Fossier chipped the puck to Robbins crashing through the crease. Second Goal (2-0 Maine): The Black Bears won the draw, with the puck kicking back to Alexis Binner. Binner sent a pass behind the net where it was picked up by Fossier, who fired a long pass across center to Chase Pearson. Pearson, a half step ahead of his defensemen, burst in and fired a backhander from along the goal line to double Maine's lead. Third Goal (2-1 UNH): The Wildcats scored their first of the afternoon on a five-on-three. Max Gildon reached up to hold the puck in the zone on the man advantage. Gildon cut to the slot and faked a shot, instead firing the pass over Liam Blackburn along the nearside goal line for the goal. Fourth Goal (2-2 UNH): UNH tied the game as Chris Miller pulled a hard shot as he peeled away from the boards, finishing a play from center. Fifth Goal (3-2 Maine): Robbins' second of the game gave the Black Bears another lead, as he captured a long pass from Brady Keeper from Maine's defensive corner. Robbins, again with space in from the blueline made a quick move to open the goaltender and fire it in. Sixth Goal (3-3 UNH): Jackson Pierson tied the game for the Wildcats with eight minutes left in the game as he collected a bobbling puck through a cluster of bodies in the high crease for his sixth goal of the year. Seventh Goal (4-3 UNH): The Wildcats had their first lead of the afternoon on a goal by Angus Crookshank with 2:46 left in the game. Crookshank cut in from the corner and whipped a backhander on net that got through. 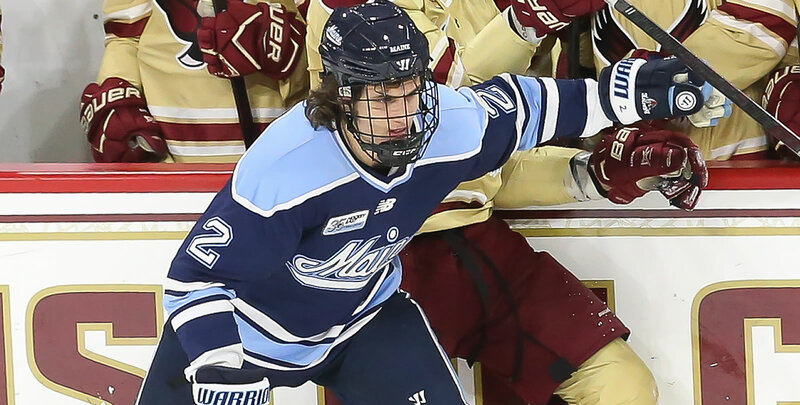 Eighth Goal (4-4 Maine): Jakob Sirota's first collegiate goal came with 1:28 left in the game to tie it, handling a pass from Pearson in the corner before firing a hard high shot through traffic. The freshman's goal was the game timing and final goal of the Hockey East contest. The two teams did battle in the overtime period, but neither could find the back of the net. 4-4 was the final score from Orono. - Jeremy Swayman saved 30 New Hampshire shots, while Mike Robinson turned away 22 Maine attempts. - The Black Bears went 0-3 on the power play. New Hampshire scored once on their four power play opportunities. - Maine blocked five Wildcat shots. The Black Bears stay home to host the No. 2 UMass Minutemen for two. Puck drop is scheduled for 7:30 PM on Friday, January 25th and 7 PM on Saturday, January 26.